‘Stumbled across your blog recently and wondered if you’d be interested in doing a bit of digging to find out what happened to London’s railings. 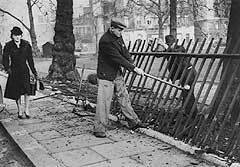 During WWII there was a national scrap drive especially active in London where a lot of railings were grubbed up and sent off to be scrapped. I have never been able to find out what really happened with this pre-emptive move to destroy London before the Luftwaffe but it seems that program was more of a public relations exercise rather than of any practical use and the railings were dumped. And that was it. In truth, I know little about London railings (image below from Knowledge Of London). I’d also heard the story that were used for scrap metal in the war, and was also aware that in Harleyford Street, SE11, some ARP stretchers used during the war to ferry casualties away from bombsites had been turned into railings (you can see a glimpse of them in Patrick Keiller’s London and they also feature in Peter Ashley’s excellent More London Peculiars). The section continues: ‘When we were children we heard all about the drive to uproot railings to produce scrap iron to assist the war effort in the early 1940s. We suspect that railings were seized and removed more keenly from working-class districts than from the fronts of the houses of people who had wealth and social and political clout. I’m not sure this is true, as I have read that railings were removed from many garden squares, making them suddenly accessible to the public (indeed, that is what is happening in the image above). That the railings were removed is beyond doubt. Here is a typical quote from somebody who had their railings removed during the war, taken from the BBC’s People’s War site. They took away our railings. Men came and cut the ornamental railing from the copings on the little walls outside of the houses, along the whole length of the road, they were taken away to be melted down to make weapons. I was interested in your item about the railings which are to be replaced in Ennismore Gardens. The tragedy is that so many of London’s railings were pulled down in order to support Britain’s war effort, bearing in mind that they never became the guns and tanks they were intended for. In fact I believe that many hundreds of tons of scrap iron and ornamental railings were sent to the bottom in the Thames Estuary because Britain was unable to process this ironwork into weapons of war. A great story, but is it true? If anybody can say for sure, please do let us know. UPDATE: The fine Johnny L, a noted nerd and jazz lover, points us towards this documentary by Jonathan Meades about Victorian houses. This entry was posted in Archaeology, Architecture, Books, History, London, Secret London, Street furniture, War and tagged ammunition, dumped, guns, Railings, scrap metal, stretcher, thames, war, WWII. Bookmark the permalink. There’s a Jonathan Meades documentary which talks about this — http://www.youtube.com/watch?v=cubBtQ4AxOQ&feature=relmfu — Meades didn’t write the script for this show, it as a very early C4 documentary, before he’s really developed his style. Being young I assumed the type you see in the video were made that way so they could be quickly removed and used as a pike. I didn’t appreciate the melting down process. The same thing happened in Glasgow. My father reports seeing vast mounds of railings piled up in a scrapyard on Alexandra Parade in the city. They were still there well after the war was over. Indeed, the sorry stumps of hacksawed railings can still be seen on low tenement garden walls. One garden in the street I grew up in stands out. It still has its original railings. My mother told me that, in 1944, it must have belonged to someone important in the council. I grew up near Ennismore Gardens and remember the chain link fences that were eventually put up around the garden at the centre of the square. These were replaced in the 1990’s (I think) by residents who raised the money amongst themselves. It was and still is quite a smart area so it wasn’t just the poor who gave up their railings. As a child I was always curious about the metal stumps that stuck up from the top of low walls and masonry where they had been cut off. Just happened to walk down the bottom end of Malet Street this morning and this started happening to me: http://www.londonarchitecturediary.com/event.php?id=3218. All good fun, but the explanation adds an interesting layer to your story, Pete, describing “a wartime initiative to democratise parks and gardens by removing their railings”, with the melting down for weapons only a pretext “better understood as wartime propaganda”. The British Government acting to democratise private space? Hardly credible, I think, but an intoxicating thought. This happened all over ther country. Wherever you go, you still often see the stubs of the railings on walls, and it wasn’t just the poor areas which suffered. I’m a railing nerd, and can get excited about them 🙂 During my career (I run an art blacksmithing company originally founded in 1932) I have been fascinated by the regular occurrence of railings coming to light having been hidden behind sheds and shrubs to avoid giving them up for the war effort. We also experienced the ‘finding’ of a large ornate pair of entrance gates, thought popularly to have been sacrificed for the war effort, secreted upright behind a fake wall at the end of a large house. I do not know much about what happened to railings but i am not so sure that the better off were spared. In around 1942 or 43 the tabloid press discovered that earlier Prime Minister Stanley Baldwin (PM 1931-37), known as the “iron monger” by his critics (he came from a family who ran a metal foundry) still had his ornamental iron gates specially made in his family foundry, and considered specially beautiful by connoisseurs of such things, which stood at the entrance to his country home. A hue and cry was made about it, “why should he keep his gates, when we had to give up ours”, etc. Specially Baldwin for it happens Baldwin was already in the dog house as popular opinion blamed him for de-arming Britain at the very point we should have been arming to meet the growing German menace (as Chruchill continously badgered him about this from the back benches). He was considered one of the “guilty men” who had left Britain un-prepared and vulnerable to invasion. He thus avoided public meetings after 1940. As it happened a special commission had been set up to preserve Britain’s most histoically important railings or iron work to spare them from being melted down during the bid to melt down railings in 1940. 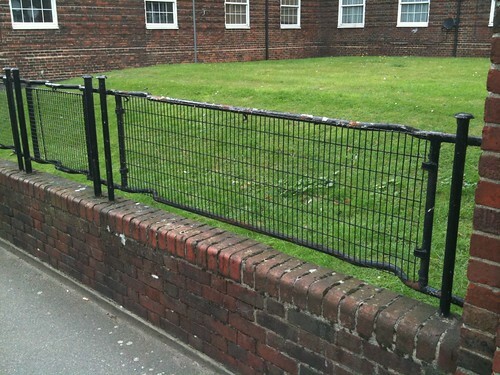 Balwin’s railings had been given a preservation order. But such was the public out-cry that Baldwin’s gates had been spared that in the end he had to surrender them to the war effort to fend off the mob. That suggests to me the upper classes were no more spared from the edict than anyone else. In fact you can see in b&w pics of the time of Eaton Square, heavily bombed, and Knightsbridge area that all the railings of the great houses had been removed. The amazing thing is that since the 1980s most of the taken railings have slowly been replaced which has brought a charm back to London – possibly one of the only good things of a property boom, ie. people pay to restore features if the house is worth a mint. As to what happened to the iron railings taken down. Well, at the same time a parallel scheme took place asking people to give up old pots and pans and the response was enormous with each borough quickly forming a pots and pan mountain. This was in the critical summer months of 1940 when people expected an invasion and were keen to do anything to help. Now this was a waste of time as most of the metal was weak and useless and the pots and pans were just dumped somewhere. Maybe this is what the above contributor is referring to re: the Thames. But the effort was worth it for propaganda purposes as the pictures of the pots and pan mountain was widely publicised both at home and abroad. From what i understand the iron from railings though were not dumped as this was good solid metal, worth melting down to re-use. And regarding Baldwin’s beleagured reputation, well you never know how the public mood goes. When he was leaving Lloyd George’s funeral service in Parliament Square in April 1945 a crowd had gathered to watch the departing dignataries, Baldwin now near deaf, was in an open top car and realised he had been recognised. He saw the people baying something at him but could not hear. He said to his accompaniant, “are they booing?” and the accompaniant replied “no sir, they are cheering you”. Railings and gates are made of steel, wrought iron or cast iron. Tanks are stainless steel, guns are gunmetal, planes are aluminium — I’ve even heard grown men tell me railings were taken away to make bullets – which are lead and brass. My grandparents lived in albyn road St johns deptford se8, my dad told me that the railings of their 3 storey house were removed during the war. I wish i had 10 skips with me when i embark on archaeology digs, down on the Thames, the amount of old railings i find could fill them easily. I had heard a story where some of it was shipped off to Sweden and sold. Regarding the raillings also pots and pans were taken i was told this scraping the railings and pots and pans was to make every one think they were doing there bit towards the war my late uncle told me most of it was dumped in the solent never used weather this is true or not i dont know but he knew a lot that went on in that area during the war.